Shockwaves Style Refresh & Root Revival Dry Shampoo 180ml is a quick solution to greasy hair or a damaged hairdo, this dry shampoo will refresh your look in various ways. An amazing, tapioca-based shampoo that revitalizes the roots of your hair and provides a shapeable, matte texture that refreshes your style and requires no blow-drying. Tapioca starch protects your hair from grease by absorbing the sebum and leaves it feeling smooth with no visible residue after spraying. All of this makes Style Refresh & Root Revival a perfect product for all those who want to revive their hair, while holding on to that great texture and style. 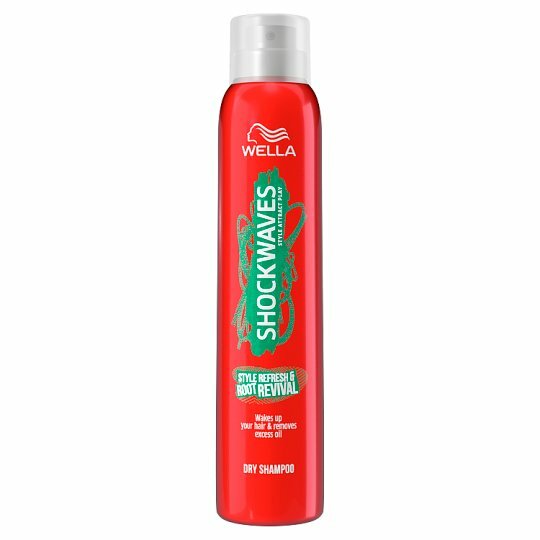 Wella Shockwaves, style the moment, your style, your moment, your way. Shake well before use. Spray into roots from about 20cm. Massage in and restyle. Danger Extremely flammable aerosol Pressurised container: May burst if heated. Keep away from heat, hot surfaces, sparks, open flames and other ignition sources. No smoking. Do not spray on an open flame or other ignition source. Do not pierce or burn, even after use. Protect from sunlight. Do not expose to temperatures exceeding 50°C. Keep out of reach of children. Do not inhale intentionally. The can must be completely empty before disposal. Use exclusively for intended purpose. Do not spray onto the eyes. Use exclusively for intended purpose. The can must be completely empty before disposal.